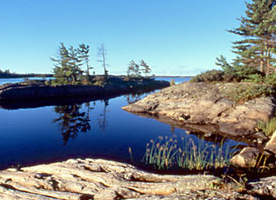 The Massasauga Provincial Park represents an area that is provincially significant from an earth science perspective through its prime representation of the Parry Sound Greenstone Belt geology. This area is important not only for the diversity of rock types it contains, but also for the processes and interactions of the earth's crust that have occurred here. The Park's geology is clearly visible to park visitors as they encounter the intricate patterns of rock outcrops, shoals and islands. Wreck Island is a day use area only, open from 7am to 7pm daily. There is no overnight camping/mooring or docking at the site. Vault toilets, picnic tables, and fire grates for preparing shore lunches are located near the docking area. Pets must be kept on a leash and please stoop and scoop. The Wreck Island Trail is a 1.5 kilometer loop that provides the park visitor with an opportunity to explore an amazing example of geological history. The trail includes nine interpretive stops at which geological features are pictured and described in a free trail guide which is available at the start of the trail. Rocks representative of this geological history are used as trail markers and have been chosen for the purpose of complementing the natural surroundings. The trail is marked by rocks with smooth-cut faces, and interpretive stops are marked by similar rocks engraved with the stop numbers. The trail is of moderate difficulty due to the sometimes-unstable footing. Proper footwear is recommended to give added support. Allow 45 minutes to one hour to complete the route at a leisurely pace. The twisted and folded rocks are evidence of the incredible tectonic forces that have shaped this island. This landscape represents an ancient erosional surface exposing rocks thought to have been once buried some 20-30 kilometers deep in the earth's crust. Similar to the Indian subcontinent colliding with the underbelly of the Asian continent, which is today forming the Himalayan Mountains , geologists now believe that the rocks in this area have experienced just such mid-continental collision beginning some 1.1 billion years ago. Mountain building was followed by millions of years of erosion. Some 450 million years ago a marine sea flooded this area leaving deposits of limestone. None of these thick deposits have survived the subsequent erosion on Wreck Island . One must travel to the distant Limestone Island of Georgian Bay to see evidence of this tropical sea. Glaciation has also contributed to sculpting the park's landscape. Continental glaciation finished the job of removing the last traces of soft limestone. The last sheet covered the Wreck Island area approximately 60,000 years ago, however, it was 14,000 years ago that an event far to the north of Hudson Bay would leave a lasting record on the island. A catastrophic release of glacial meltwater occurred, releasing a huge quantity of debris-laden water with "nowhere to go". Ice still covered this part of Georgian Bay, including Wreck Island , as the water rushed southward. It traveled beneath the ice under tremendous pressure. The water was able to push up the base of the glacier and travel along the ground. The rushing torrent was filled with sharp grit, cobbles and boulders. This torrent attacked the rock surfaces of Wreck Island much like a giant sand blaster, resulting in the erosional processes evident today.